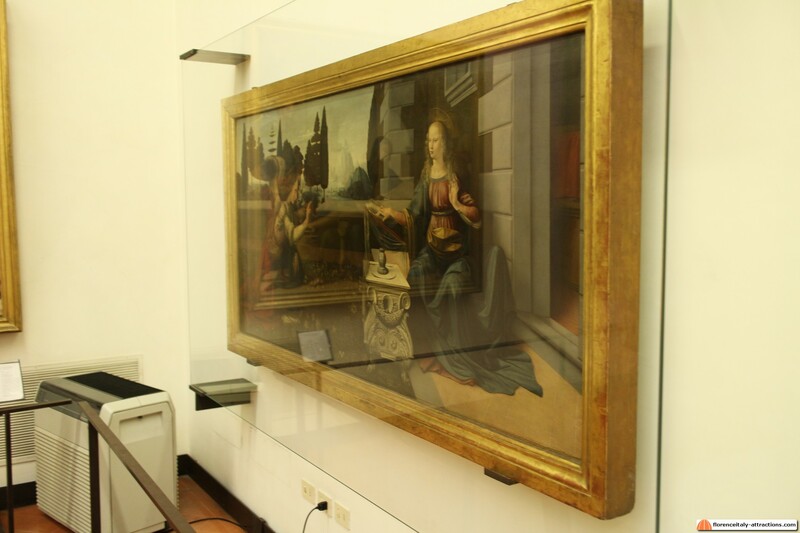 Leonardo da Vinci Annunciation has long been considered by Domenico Ghirlandaio and there are no records of the commission and its original location. 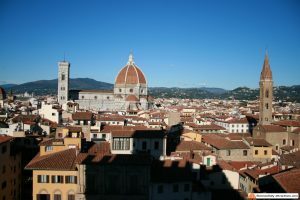 The work originally was in the church of San Bartolomeo at Monteoliveto, on the hill South of Florence, from where it was moved in the Uffizi Gallery in 1867. 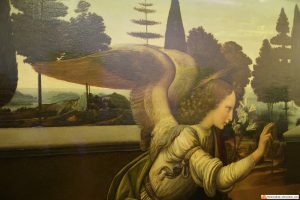 Leonardo da Vinci Annunciation is an unusual painting: the scene, unlike the tradition that sets the Angel’s announcement within a room, is represented outdoors, in the garden of a typical Florentine building. The Madonna is represented while reading a book placed on a bookstand whose decoration recalls the style of Florentine sculptures of 400, in particular the tomb of Piero the Gouty, executed by Andrea del Verrocchio (Leonardo da Vinci’s teacher). Leonardo, who uses perspective to paint the lines of architectural elements, introduces a new concept of space built through the use of light and color, such as in the lake landscape in the background, whose distance is suggested by the special atmosphere and blue tones. This technique, called sfumato, was typical of Leonardo. In this painting we understand the special attention of Leonardo da Vinci for the natural world. Dozens of flowers decorate the lawn while beyond the boundary wall of the garden, a row of pine trees of different species defines the horizon, increasing the sense of remoteness of the small harbor. The wings of the Angel are another clear reference to Leonardo’s interest for nature. Leonardo da Vinci Annunciation raises a mystery. Did Leonardo make a mistake? The perspective of the Virgin Mary is not entirely correct: the right forearm of Mary doesn’t seem to be in the correct position. 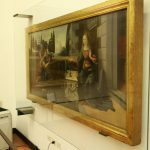 A theory developed in the 1980s states that, since the painting was made for the right wall of the church, Leonardo adjusted the perspective to give the observer a better point of view. It’s a fact that if you observe the work from right, the aberration seems less evident. 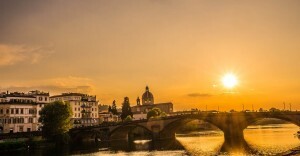 Not an easy task though, as this is one of the masterpieces of the Uffizi that generate a large crowd.